Korean manufacturers Samsung and LG often match each other in product introductions, but today they were together in announcing cheaper options for some of their latest TV technology. Samsung is dropping the price on its new 55-inch curved OLED (above) and LG rolled out two lower priced versions of its 55- and 65-inch 4K TVs that sacrifice a few premium features. In Samsung's case, the price is dropping by 34 percent, from 15 million won ($13,500) to 9.9 million ($8,910). While we'd heard the KN55S9 will arrive in the US mid-August for $15,000 there hasn't been an official announcement yet, but Value Electronics is promising more details on the 14th. 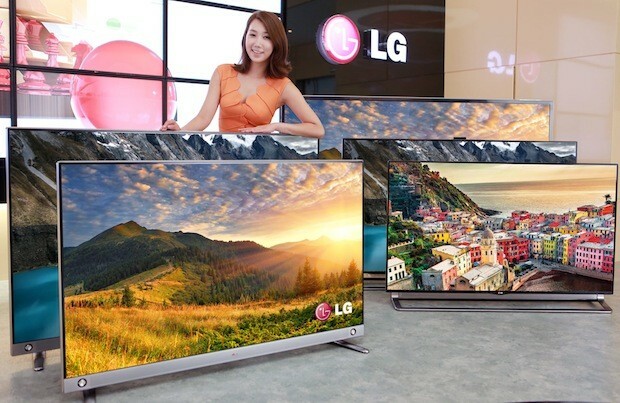 For LG, the new LA9650 (pictured after the break) variant of its 65-inch UHDTV drops to 8.9 million won ($8,010) compared to 10.9 million ($9,810) for the original LA9700, while the 55-inch is 5.9 million won ($5,310) compared to 7.4 million ($6,660). In the US the original models sell for $7,999 and $5,999, respectively, while retailer B&H already has placeholders for the new models with US prices of $6,999 and $4,999. If the listing is accurate, we could see these versions ship in the US around October 23rd. These new models give up a few creature comforts like the bottom-mounted motorized 4.1 speaker and camera, but keep the pixel count along with fixed 2.1 speakers and 16GB of memory for DVR functions. According to the Korea Times, Samsung's price cut came as a result of improved manufacturing yield, and customers that already purchased one will be refunded the difference. Of course, these prices are hardly mass-market or challenging value priced entries from Chinese manufacturers Seiki or TCL, but is remarkable to see OLED technology dropping below $10,000 so quickly.